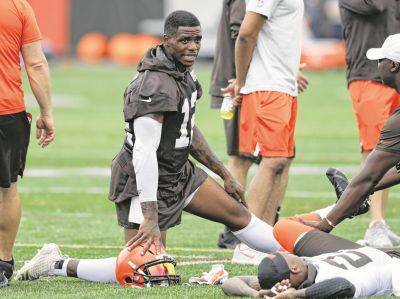 Josh Gordon is missing the start of the Cleveland Browns’ training camp in Berea as part of his treatment to battle drug and alcohol addictions. BEREA — While Josh Gordon’s away, the Browns may launch Plan B with their wide receivers. Dez Bryant is on their radar. As they await clarity on Gordon’s cloudy situation, Cleveland general manager John Dorsey said Wednesday the team has discussed signing Bryant, the former Dallas star released by the Cowboys in April. Gordon is missing the start of training camp as part of his treatment to battle drug and alcohol addictions, and the team does not known when — or if — the 27-year-old will be back. Dorsey said he “absolutely” expects Gordon to return in 2018. In the meantime, the Browns have interest in Bryant, a three-time Pro Bowler and one of the game’s top playmakers since 2010. Especially given Gordon’s track record. Despite his numerous missteps, the Browns are standing by the talented receiver. They believe Gordon has turned his life around and are counting on the former Pro Bowler, who has played just 10 games since 2013 due to numerous NFL drug violations, to help this season. Dorsey doesn’t know when Gordon will return, and the club changed his roster designation from the non-football illness list to “did not report” so it would have roster flexibility. An NFL spokesman said earlier this week that Gordon has not been suspended again, and that there is no timetable on his return. However, both Dorsey and coach Hue Jackson refused to answer whether they’ve received assurances from the league that Gordon is not facing further discipline. On the eve of his third training camp, Jackson, who has not spoken with Gordon, wanted the focus on his available players. “Obviously we’d like to have all of our players here. But at the same time we know things do come up,” he said. “And I think as a staff we prepared for anything and everything. I think in my going on three years here I’ve seen it all. So I’m not surprised by anything that can happen. I think if we make it more than what it is. With Gordon’s status unclear, Dorsey said the team is considering Bryant, who is looking for a fresh start. The 29-year-old developed into one of the league’s most physical receivers during eight seasons with Dallas. He had three seasons of more than 1,200 yards receiving and led the NFL with 16 touchdowns in 2014. However, he came up short of living up to the five-year, $70 million contract he signed four years ago. Bryant battled an assortment of injuries before the Cowboys let him go to gain salary-cap space. Bryant has had some off-field issues, though nothing to Gordon’s level, and his fiery temperament led to some well-publicized sideline rants. But with Cleveland’s receiving corps reduced by Gordon’s absence and a season-ending neck injury to Ricardo Louis, the Browns may be willing to overlook any baggage.